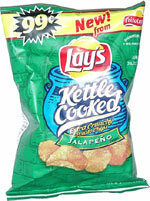 Taste test: These are very crisp kettle-style chips with a kind of weak jalapeño flavor and minimal jalapeño heat. If you eat them at a normal pace with sips of a cold beverage in between chips, you might not notice any heat at all. If you eat several chips in fast succession with no beverage breaks, you'll taste some actual jalapeño flavor and feel some slight heat in the aftertaste. For those who are in it for the heat, I'd suggest trying some other hot chips besides these. But these aren't bad chips, if you want a regular potato chip with a slight jalapeño edge to it. Smell test: Good medium-strength jalapeño smell. 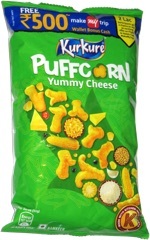 This snack was discovered by Jeremy in Las Vegas. Review published .